Two out of every three Bangladeshi women is a victim of domestic violence, says a recent study. The figure stands around 66 percent and nearly 73 percent of them have never disclosed it to others, according to joint research by ActionAid Bangladesh and Jatiyo Nari Nirjaton Protirodh Forum (JNNPF). 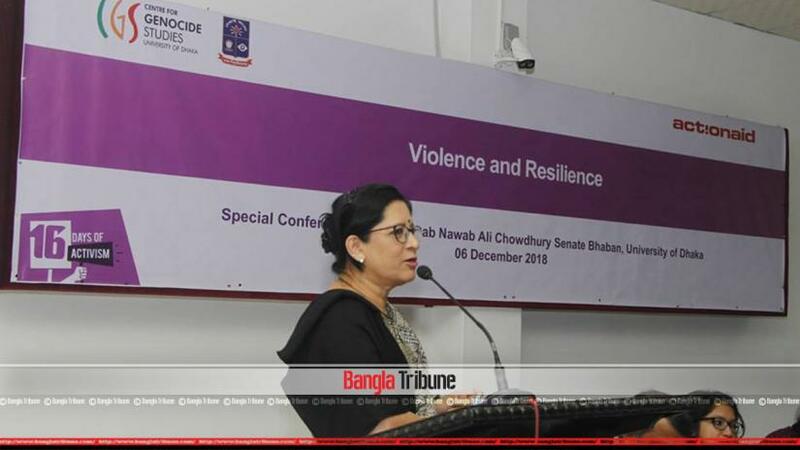 Findings of the study titled ‘Spotlight on violence Against Women in Bangladesh: Trends and Solution’ were revealed on Thursday (Dec 6) during a seminar at the Dhaka University, coorganised by its Centre for Genocide Studies (GCS) and ActionAid Bangladesh. ActionAid consultant Ahmed Ibrahim presented the findings at the seminar. The study says, most of the women in Bangladesh still suffer from chronic abuse, torture and violence in home. Despite high rates of partner violence, most women don't want to disclose their experience to others. The research identified 1,773 domestic violence cases and found that the majority of them were dowry-related disputes. It also found that there are no laws that can provide direct protection against any form of violence other than dowry demands after marriage. GSC Director Prof Imtiaz Ahmed, ActionAid Country Director Farah Kabir, AM Nasir Uddin, Manager-Disaster Risk Reduction of ActionAid Bangladesh, Taslima Yasmin, Assistant Professor of DU law department and Tasnuva Ahmed, Head of Operations of Colours FM, among others, addressed the seminar.